Fluffers cruise around Tankwa to the various work stations and 'fluff' all those trusty participants who are on shift by insuring they have sufficient water, shade, and sunblock. This was a new volunteer role in 2017, and everyone who has ever "Fluffed" had a blast. The aim is to take good care of all the volunteers on shift. 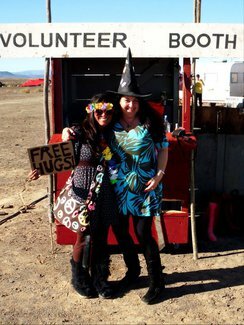 Fluffers show kindness, smiles, and caring and supply an oomph of motivation, which includes spritzing volunteers with water, handing out candy, etc. The role also involves helping to spread the great word about volunteering..... We all know a little bit of love can go a long way! If this sounds like its up your alley please sign up! I would love to be a fluffer, i do caring for a living. I Wanna Fluff You Up!